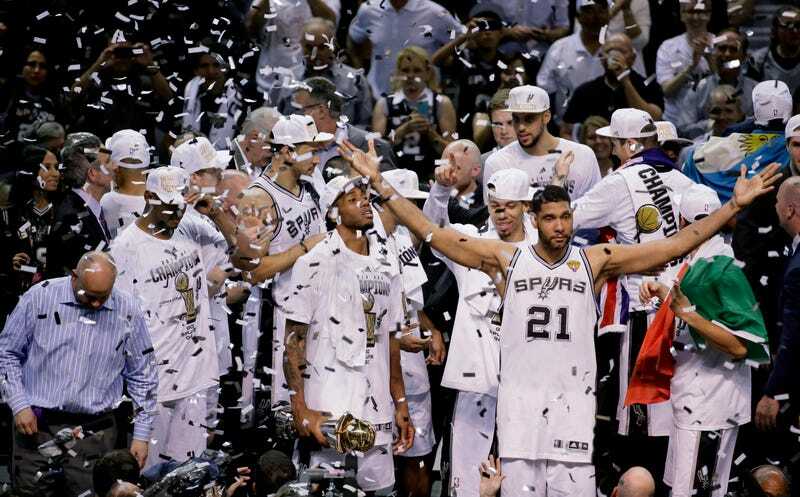 The Spurs' title is yet another coronation for the old guys, a fifth championship for Tim Duncan and Gregg Popovich and a fourth for Tony Parker and Manu Ginobili. But if you really want to know how the Spurs keep doing this, it's worth viewing this title as something much more prosaic: It's the culmination of a rebuild. Look at the Spurs of 2009-10. (A "low point" in name only. Their 50 wins, still pretty damn good, were the fewest for the franchise since 1996-97, the year Popovich took over mid-season. But it works for us; the 2010 second-round playoff loss came sandwiched between two seasons with first-round exits.) Outside of the big three, those Spurs' major minutes came from the likes of Richard Jefferson, George Hill, Roger Mason, Keith Bogans, 20-year-old DeJuan Blair, and 35-year-old Antonio McDyess. Something needed to be blown up. The challenge was twofold—rebuilding around the core, and convincing that core to stick around. That second part was easy enough; once Popovich and GM R.C. Buford made clear they weren't leaving, Duncan, Parker, and Ginobili were willing to give them the benefit of the doubt. And why not? They had done this rebuild once before, retooling a 1999 championship team into one, four years later, that barely resembled it. Danny Green, signed in 2010 after being waived by the Cavs after his rookie season. A year spent mostly in the D-League prefaced Green's breakout year, and a three-year, $4M per deal inked in 2012. Kawhi Leonard, acquired in a 2011 draft-day trade for George Hill. A steal at 15— really at any place in what turned into a disaster of a draft—Leonard is the heir apparent for the Spurs' next generation. "I think he's going to be a star," a prescient Popovich said after Leonard's rookie season. "And as time goes on, he'll be the face of the Spurs." Patty Mills, first signed as a free agent toward the end of the 2012 season. His brief NBA career derailed by injuries, Mills played in Australia and China before the Spurs took a flyer on a cheap three-point specialist. Boris Diaw, signed as a free agent in 2012 two days after being waived by the Bobcats, and resigned at $4.6M per. A potential star at one point with the Suns, Diaw seemed to have become a washed-up fat guy. Only the Spurs saw what could be salvaged, and perhaps only the Spurs could have used him the right way. Marco Belinelli, signed as a free agent in the summer of 2013. Playing nearly identical minutes as his past few seasons in Chicago and New Orleans, Belinelli set career highs in FG percentage and three-point shooting percentage. Just that easy, right? Not a big name in the bunch, nor an expensive or long-term deal that the Spurs couldn't swallow if it didn't work out (save Splitter's). Yet these six—all of them, again save Splitter, bring a fast-paced, make-the-extra-pass sort of game—redefined how the Spurs play, and win. If you see people making "boring" jokes today, you can be sure they haven't watched San Antonio in a while. These Spurs are easily the most fun team in the association these days, resembling Diaw-era Phoenix more than the Robinson/Duncan sloggers. It shows in the numbers: The Spurs' shooting percentage in this series was the highest ever for an NBA Finals, their average margin of victory a Finals record too. It's a shocking reinvention, one that took more than a decade to totally come to fruition. (Spiritually, these guys are more in the Parker and Ginobili vein.) And I can't find enough praise for the organization—for Buford, who played to strengths no one realized the team had, for Popovich, who has managed to adapt in a way that few coaches could, and for Duncan, who's been doing his thing for 17 years, never at the expense of what his team is trying to accomplish. This is the new blood, but it's no last hurrah for the old guys. With the role players on short deals, there may be new faces next year, but the marquee names will remain the anchor. "I think everybody's gonna come back," Tony Parker said. Team chairman Peter Holt went a step further: "Tim and Manu are going to play until they die, so I think we are in pretty good shape."